If you use facebook occasionally, then you will find this pretty interesting. As we all know, facebook is 'free'. You can connect with friends, share photos and ideas, and hang out there without paying any fees. For the most part, any ads that appear on the site are small and limited to the right side of the page. 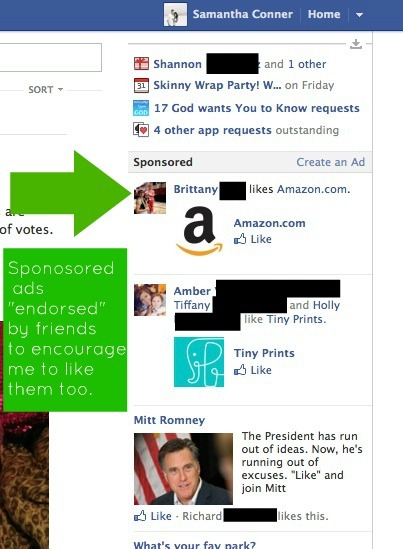 In fact, until I really looked for them, I didn't even notice that facebook had advertising. Beyond my personal facebook page, I have two business pages. 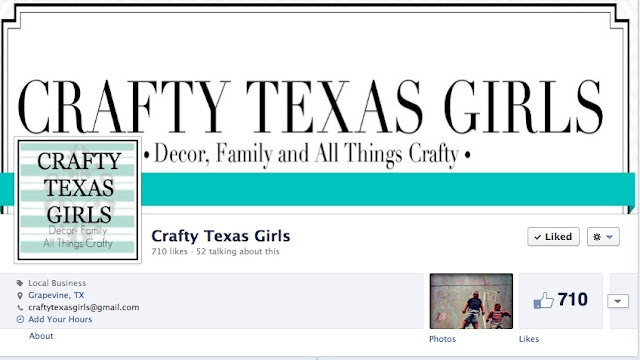 One for "Samantha Conner Designs" and one for "Crafty Texas Girls". I like to post regularly to my Crafty Texas Girls facebook page because it is a great way to communicate with readers and share ideas that I don't neccessarily want to use for posts here. I also like it because I can share links from this blog when new posts are published. I am not crazy about recruiting 'likes' for my pages. But I do make an effort to encourage readers to follow my blog either through facebook, an email subscription or programs like GFC. These avenues help readers stay in touch and read my blog regularly. I looked a little deeper and it turns out that facebook chooses the content you see in your news feed. The more you interact with a person or page, either through comments or likes, the more that type of 'story' will appear in your news feed. So basically if you follow a page, but are the 'silent type' :) -- then you will no longer see that page's updates in your news feed. Because facebook has decided what it wants you to read. 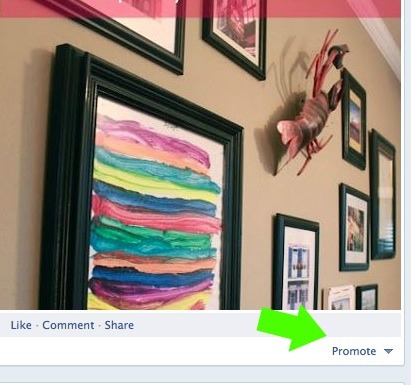 Then I noticed on each of my page posts, a little box that said 'promote'. 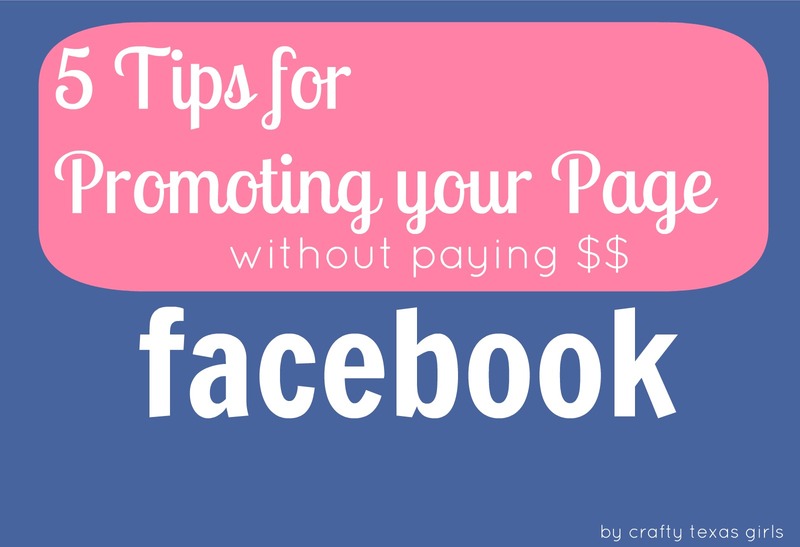 Facebook has been so kind to offer me the opportunity to pay for my readers, my fans to see my posts! What??!! I thought this site was free! 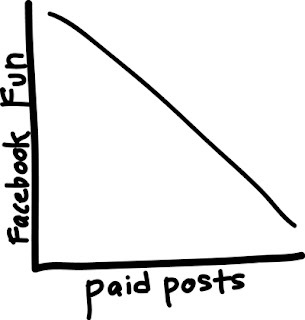 The more I pay, the more people that my posts will actually reach. If I choose not to pay, then readers who enjoy my posts, but don't feel the need to comment on everything they read, will not be able to see my content in their news feed. That doesn't sit well with me. Yes I know facebook is 'free'. But remember this, facebook only exists because we (you and me) provide the content. We are the writers of facebook. Without us posting photos of our family vacations, updating our status, and re-posting links for articles we want to share, facebook would cease to exist. We are facebook. They NEED us to log on, they want us on their site as much as possible, for as long as possible. Can you imagine what would happen if everyone boycotted facebook for an entire day?? So since it is people like us that make facebook a popular site, and we have taken the time to create and 'like' pages we want to see---why is it so hard for us to read what we want? Why are we unable to reach the people who have taken the time to click that 'like' button on our page? The answer is Money. 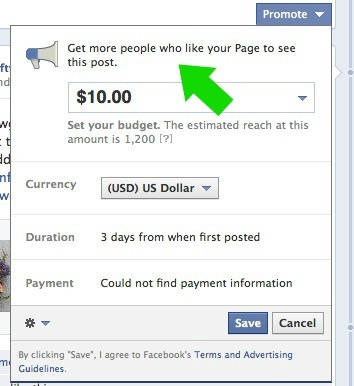 It may be 'free' but facebook needs to generate money. So they will charge for ads and then they will turn our posts into ads and charge for those too. Which basically means, your news feed will just become one big advertisement. And that news feed/advertisement will be full of big companies and big blogs who could afford to pay for you to read their content. And then what will happen to everyone else?? The small business, the little blog, those with ideas and insight you enjoy? I am not sure the future of facebook. I will continue to use the site because there are parts of it I really enjoy. I like having all my favorite blogs in one place. I like seeing my friends and their kids. I like hearing about what my out-of-state family is up to. But you can be assured, I will not be paying for anyone to see my posts. Manually add a page to your news feed. 2. Ask readers to manually add my page to their news feed. Other examples are to follow along via pinterest, twitter etc. 4. Promote my content by using other sites-- such as pinterest, twitter, linky parties etc. 5. 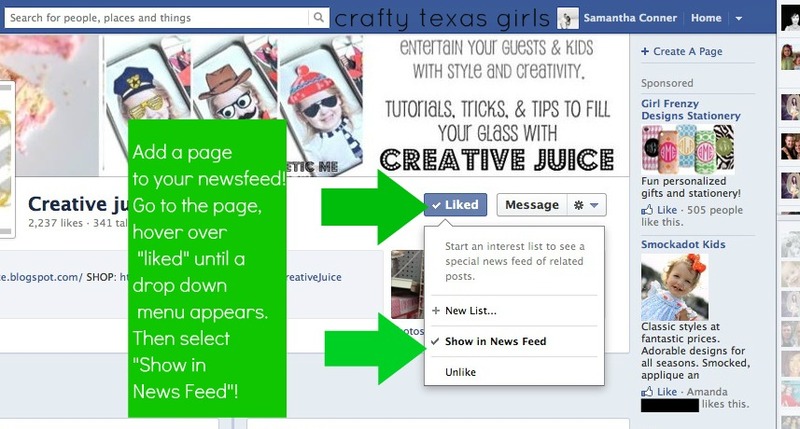 Remind readers they can create a facebook 'list' made up of pages they have liked. This list can be specifically for blogs/businesses/pages they enjoy following. Sometimes putting all your pages in one place will make them easier to locate and follow. **And in the end, remember-- do not worry. Good content will lead to loyal readers who share what they find helpful, creative, interesting, and fun! What do you think about paid posts? Are you a fan of the facebook changes? Interested in joining in on the conversation- pop on over to my facebook page and leave a comment. Or let your voice be heard right here! Please feel free to share this post with your readers, let them know the best way to follow you! You have answered many questions for me through this post. I will eagerly share this with my readers and add my thoughts. I agree about not paying Facebook for anything! Thank you so much for this!!! Definitely not paying to have readers see my posts. I knew a little about this, but this is more detail. Thanks! I had heard FB was now doing this with Fan Pages and it was so upsetting! I guess now that FB is a public company, they have to secure more revenue! Like you said, the small business and blogger will now be the one that suffers. Wow, this was a very informative post and I will be sharing this so that my readers will know. It is not right that Facebook is not having my followers see my posts! They should be able to generate enough revenue from regular ads and games that are on the site to not have to do something like that! Okay, this is probably a silly question but how do we let our followers on FB know these things if they can't see our updates? Is there a way to message them all? Thanks so much for this post! Your suggestions are awesome! I am so glad to hear we are all on the same page about this topic! I also have a facebook page for myself and one for my blog. 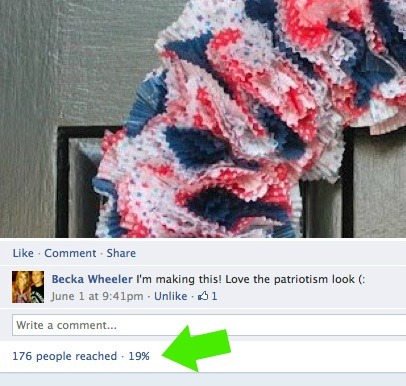 I noticed the same thing on my blog posts - 19% reached etc. - I didn't know what that meant! Now I do! Thank you for the information! Wow! What great information! I always wondered why the percentage was so low! Definitely not paying Fb for anything! Wow! I am new to Facebook and this was very, very helpful. It's just like the drug dealers...the first one is free and then they've got ya! Thank you for this - I was not aware this was happening but did notice the reach percentage had dropped. I'm sharing your post on my FB fan page. That was great info, thank you very much. So true! I've gotten really fed up with FB wanting to charge for everything and not showing me what I want to see. I think it's going to be replaced by Google+ (I just wrote a post about why). It's seems to be that they're getting greedier and greedier. I still have my FB page but I try to focus on other avenues for my readers to follow me. Pinning this!